Emmie Heathman persuading a Cradock farmer the stove is worth saving. Emmie Heathman trips out of Annie’s Guest House on Adderley Street in Cradock, bangles jingling on her wrists and toe rings twinkling like her roguish eyes. She wears mascara and girly sandals, and apart from her no-nonsense mien and a toolbag, she’s not exactly what you’d expect from someone who fixes large anthracite stoves for a living. But there’s no time to hang about chatting. There’s a farmer up the road with a sick Aga, and we’re expected. The offending Aga has been leaking sulphurous smoke. 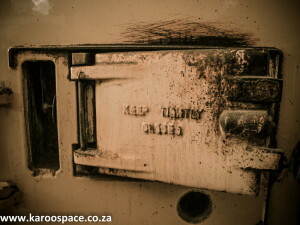 The farmer (let’s call him Oom Piet) has had it up to here with the stove. It’s been burping hellfire-scented smoke into the kitchen for the last year or more, staining the ceiling sulphur yellow. It was bad enough when he and his wife were on their own. But now they have a gorgeous little baby girl with tender lungs, and Oom Piet is muttering that he wants to strip the thing down and turn it into a kaggel (fireplace). The smoking Aga has messed up his whole, dearly cherished daily routine. For decades, winter or summer, he’d sat in his frayed armchair beside the warm stove, his hands wrapped round a hot cup of coffee. Now where must he sit? Next to a cold lump of metal? No, rather make it into hearth, he reasons. In fact, he’s clearly hoping Emmie will diagnose the Aga as being beyond all repair so he can vent his frustrations on it with an oxy-acetylene torch. It’s a deal that would appeal to any tight-fisted sheep farmer. But he’s clearly still smarting with disappointment that he can’t hack up this misbehaving stove. 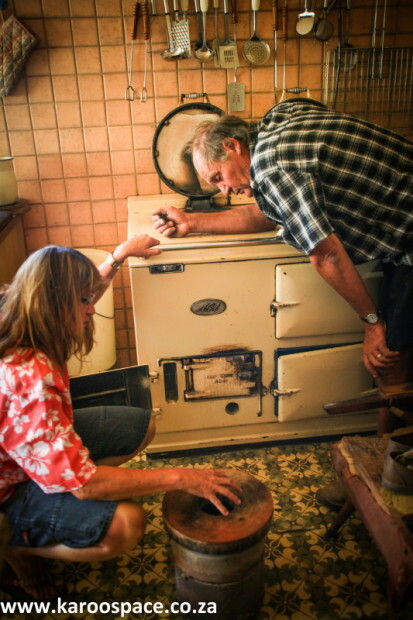 To the Oom’s chagrin, he gets a crash course on the cunning inner workings of Aga stoves, a difficult thing for a boer-maak-‘n-plan kind of guy to stomach. An Aga stove has many ovens, some hot, some cooler. Emmie points out he needs a different attachment to his chimney, and plus, the way he’s been loading the stove with anthracite, just chucked in with all the dust, has slowly worn away the precision-engineered galvanized iron plug on one of the plates. Despite himself, the Oom is fascinated. Who would have thought that the current bane of his life was so beautifully designed? He’d inherited the farm from his parents and barely knew how to use the stove. His wife is town-born, and she didn’t know either. Emmie’s passion is persuasive. She considers Agas to be one of the industrial age’s finest products, cunningly devised by Swedish engineer Gustav Dalen, unchanged in 70 years by English manufacturers to deliver maximum recirculated heat with minimum fuel. Aga stoves are found all over the country, but their heartland in South Africa surely must be the Karoo, where they exude warmth, comfort and the enticing smell of slow-cooked roasts. The steady comforting heat of Aga stoves has saved many a frozen Angora goat or orphaned lamb. 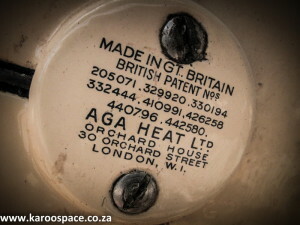 Aga – the maker’s mark. How did she end up tracking back and forth across the country, fixing ailing Agas? Her former husband started with them when he was in the spares business back in KwaZulu Natal. The stoves and their spares became a bit of a sideline. Emmie, who owned a car repair workshop, slowly became more and more fascinated by the stoves. She ended up going over to Aga in England to do a course. Being a woman, she thinks, is an advantage in this business. 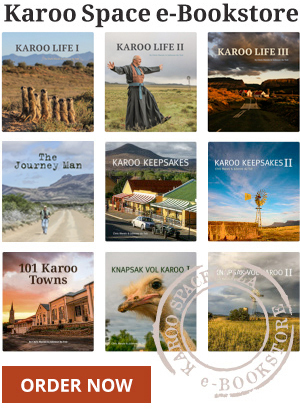 You’ll find one in most Karoo farmhouses. It’s a never-ending job, and she spends most of her life on the road. The upside of this wandering life, she says, is meeting incredible people, and adventuring around the country. Call Emmie on 082 965 6560 or visit http://www.agalady.co.za. 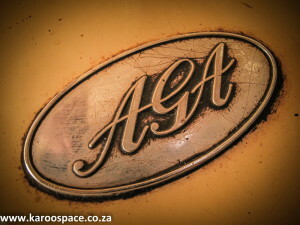 For more information on Aga stoves, see http://www.agastoves.co.za. Looking for a second hand Aga, can you help?? 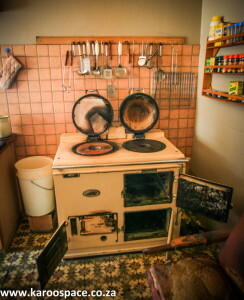 we have a rayburn stove, we have managed to find all the missing parts,but now have decide if it fits into our kitchen. We are toying with the idea of selling it, but do not know what it is worth. I can supply pictures if required.